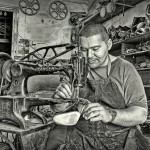 In this personal project Allen will attempt to document some of Malta’s traditional craftsmen and trades that he feels have come under threat since Malta joined the European Union. Having lived both in the UK and Republic of Ireland prior to joining and after joining the E.U. he has witnessed first hand how traditional craftsmanship has gradually faded away. From the local grocer giving way to supermarket chains to the traditional cabinet maker going out of business due to mass produced furniture being sold at local retail parks.